I always say that Reggaeton was yet another wave of Latino music that made it big in not only Spanish, but English as well. It carried with it the ability to cross over, back and forth, from one language to another; it brought with it Latino pride and called it out in some of the first songs from N.O.R.E. and Nina Sky; and it carried a collaboration factor because at one point it felt like every song had either Daddy Yankee or Ivy Queen featured. The music emerged as an Urban Latino push that crossed nationalistic borders. It wasn’t just a Mexican or Puerto Rican phenomenon. It brought with it a “if you’re proud to be Latino, stand up.” As much as people didn’t like the rise of Reggaeton, I secretly did enjoy it and listened to it with my sister because at the time, it was the only thing on mainstream radio that related to me. I could hear it and identify with it and it was the “pop” music of the time. It was every where. But then, the inevitable happened. It started to be a pigeon-holing ploy directed to Latinos and the fad died. What ever happened to those singers and performers? Where did all the hype go and who died to make Pitbull King of Latinos? The only time you hear Reggaeton now is in the Latino clubs or on Spanish radio and once again it was “given back” because mainstream was getting tired of it, apparently. 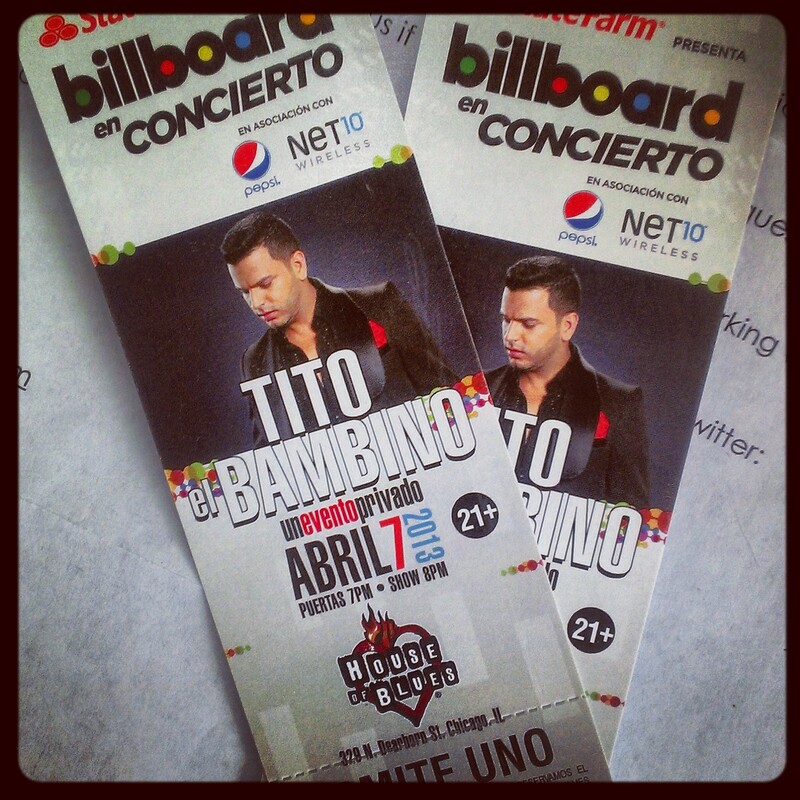 So when I found out that Tito el Bambino was coming to Chicago for the Billboard en Concierto Series, I decided that I wanted to go. He represents the romanticism, the Urban Latino feel and the collaborative goodness from a couple of years ago. Although he only sings in Spanish, I can dig his music and his vibe. Especially when he can mix in different types of music to make a great dance beat and be included in weekly workouts, I can appreciate the music that he’s making and putting out there. I don’t even know if what you can call him is Reggaeton anymore. He seems to be branching out more and more per the video with Marc Anthony above. How can you not enjoy someone who works with Marc Anthony? Tomorrow my sister and I will be able to meet-and-greet Tito el Bambino and watch him perform at the House of Blues here in Chicago. I am definitely looking forward to it. I’ll be tweeting from my personal account @Kiki416 and using the hashtag #Net10Latino. Thanks to Net10 I’m able to attend my first Reggaeton concert ever. For more information about this concert and the Billboard en Concierto Series click here. Previous Deception. Paris. 2 women. 1 man. A dog.